Can you believe it's been two! whole! years! since I started this little blog? Holy man, where does the time go? 163 posts later and I'm still in awe that people other than my sister and a handful of close friends read these pages on a fairly regular basis. Many of you, okay, most of you are complete strangers and you've welcomed my words, recipes and photographs into your world. It's humbling, let me tell you. Never in a million years would I be here unless you guys were too, so thank you so very very much for hanging out with me through the joys and sorrows; the cat talk and mom talk; the cake and the kale. Thank you for every kind comment and encouraging word - they go straight to the heart. Thanks also for letting me know when I goof up (it happens! - I'm not a robot!). Lately I've been trying to surround myself with things that make me happy (tea, chocolate, cats, books, food mags, Bruce Springsteen, Downton Abbey, Bradley Cooper - oh to be surrounded by Bradley Cooper!) and you know what? This little blog makes me really, really happy. It's a joy to sit down in my den, with slippers on the feet and a cat on the lap, and share a little piece of my world with you. Thank you for two wonderful years. Let's rock the heck out of year three, shall we? So it's not really an anniversary unless there are prezzies involved. And my anniversary present to you is my very first giveaway. And it's a good one - The Smitten Kitchen Cookbook! Funny story: so I bought two copies of the book before Christmas, giving one away to a good pal and the other intended for one of you. Even after I flipped through it and fell in love with it, I was like "No Renee, you cannot keep this book - it's intended for one of your readers." Self talk. It's a good thing to have around. Then, just a couple of days before Christmas, The Food Bloggers of Canada had a giveaway on their site, giving away - you guessed it - a signed copy of The Smitten Kitchen Cookbook. And guess what - I won that book! Crazy joy happened. I'm going to keep the book with Deb Perelman's autograph, I'm sure you'll understand, but one of you lucky readers will win the other one! I'll have details at the end of the post, so stay tuned for that. So exciting! I'm so fortunate to have such lovely, loyal fans and I kind of love that I'm able to give something back to one of you. What better way to celebrate an anniversary than with eating things I hold near and dear to my heart - yes bacon and maple syrup I'm talking to you. Bacon is no stranger around these parts, and maple syrup is an absolute necessity in my kitchen. Deb's cookbook is full of so many awesome recipes I can't wait to try them all - but these biscuits popped out at me immediately - mainly for their inclusion of bacon fat, which is genius. 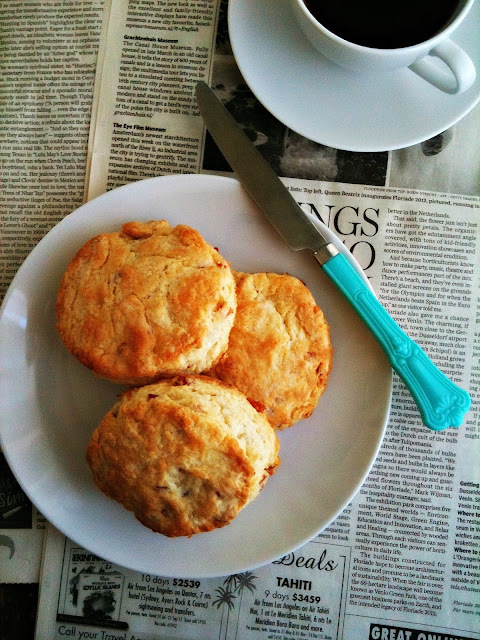 There are other fine scones and biscuits kicking around in my recipe index, but these biscuits, oh man, these biscuits are supreme. Think sweet and salty, flaky and terribly tender. It's what you dream the perfect biscuit will be like. That good. Let's get started! Cook some bacon - in the oven is the best. No mess! Drain off that bacon fat into a small dish and put it in the fridge right away - you need it to solidify cuz it's going in the biscuits. Chop a few slices of cooked bacon and stir it into the maple syrup. Awesomeness. 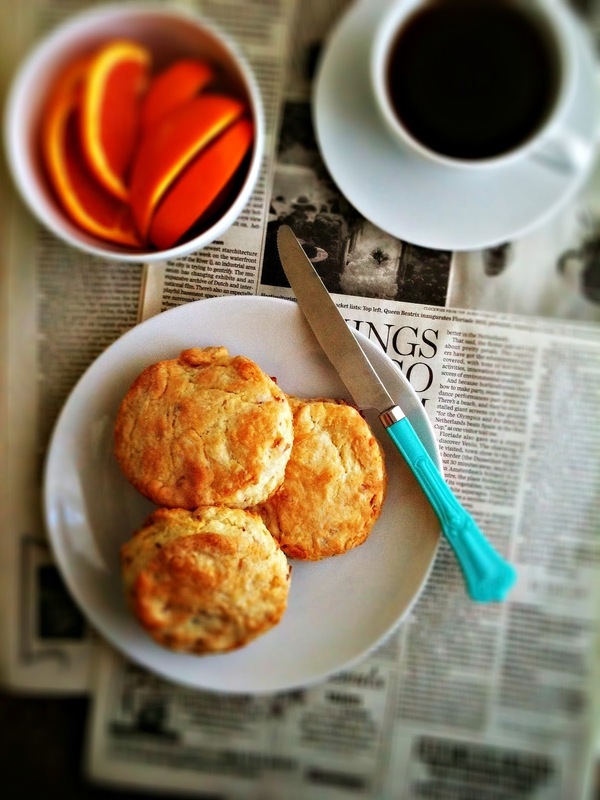 Know what else makes these biscuits so darn light? Buttermilk. Always buttermilk. Careful not to overwork the dough cuz that just toughens it up - and you don't want that, do you? 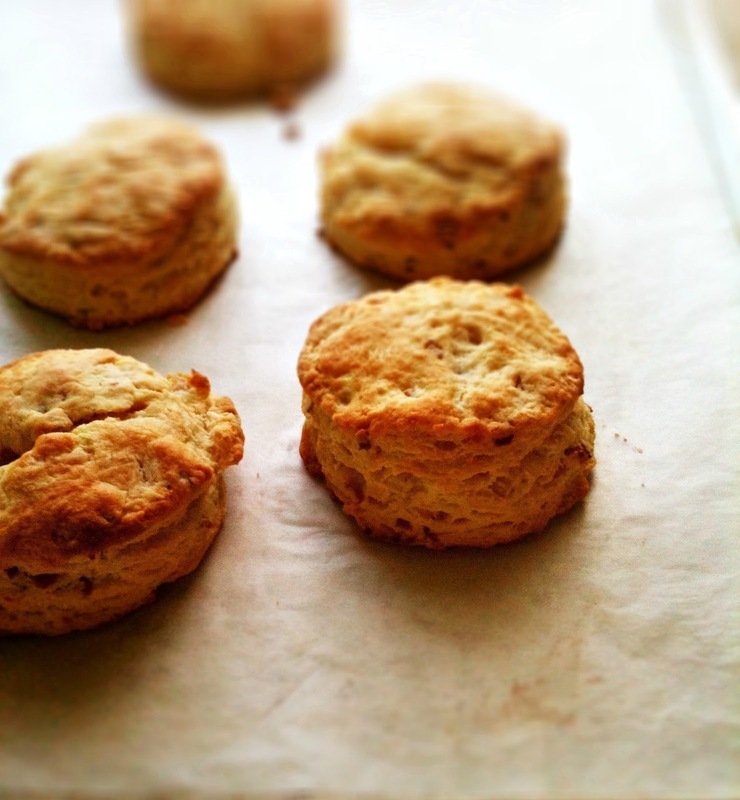 The recipe makes 6 large biscuits, so feel free to double the recipe for larger crowds. They freeze like a dream too - either by placing them raw on a cookie sheet and then straight to the freezer, or baking them first then freeze any leftovers. Gently rewarmed, they are almost as good as the morning you first baked them. I followed Deb's recipe almost to the T, adding another slice of bacon and more buttermilk. Cook bacon until crisp, remove it from pan and drain on paper towels. Pour the bacon fat into small dish and put into fridge to solidify. You want about two tbsp of solid fat. If you don't get two tbsp, just increase the amount of butter by whatever amount you are short. Chop the bacon quite small and place in small bowl, pour in the maple syrup and set aside. Preheat oven to 425*F. Line a bake sheet with parchment. Mix together flour, baking soda, baking powder, salt in a large bowl. Using a pastry blender, cut in the chilled bacon fat and butter into the dry ingredients until mixture resembles coarse meal. Add the maple/bacon mixture and the buttermilk, stirring gently to combine, so everything is evenly moistened. 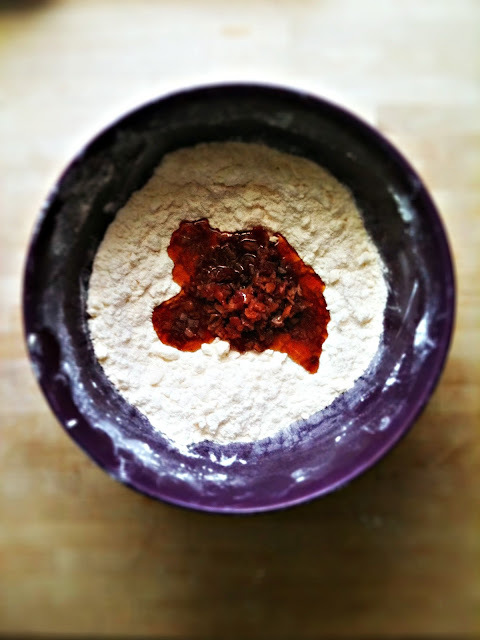 Dump out onto a lightly floured surface and knead a couple of times until it just comes together into a dough. Pat into a one inch thick circle, and using a two-inch cutter, cut into 6 biscuits. Arrange biscuits on bake sheet and bake for 12-13 minutes, until golden and puffed. Serve warm. Do ahead: freeze them raw on a bake sheet until solid, then place in a freezer bag. Add a couple of minutes to baking time. Recipe from The Smitten Kitchen Cookbook. Now to the good part! To enter the contest leave a comment below, saying anything really - like what you're making for dinner tonight, or what your favourite post of mine was, or just tell me what the weather is like where you are. For another entry, "Like" Sweetsugarbean on Facebook and leave a comment on the post there. Be sure to leave some sort of way I can get a hold of you when you win - email is great! If you'd rather send me an email privately, you can do that too. Contest is open to Canadian and US residents, and closes Sunday, Feb. 3, 2013. Winner will be drawn randomly. Good luck to all of you! Dinner tonight was leftover lasagne. It's a nice warm meal on a cold night. In typical Canadian weather fashion, after -36C last week, today, it is +9C and raining in central Ontario. Go figure. 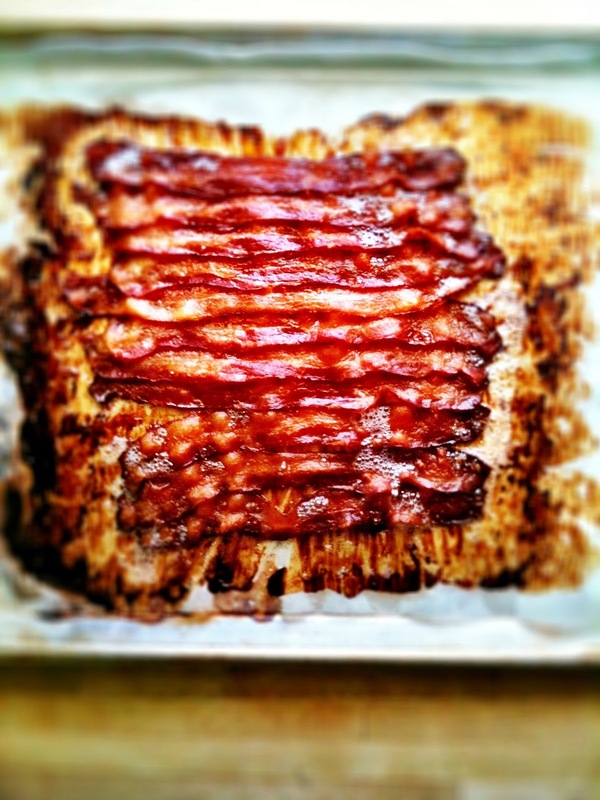 And speaking of bacon, (Ottawa) Paula inspired me to try making my own. I have a pork belly curing in my fridge right now. I'll let you know how it turns out and I'll save a bit to try in these lovely biscuits! saskatoon this morning - minus 43 with the windchill....my day is definitely going to involve baking - muffins for breakfast, baked pork chops for dinner, maybe even some cookies...ANYTHING to keep the oven going! Dinner tonight will be a simple but crowd-pleasing spaghetti with marinara, probably with some garlic bread & a salad thrown in the mix. Good morning early birds! Thanks for sharing your weather and dinner info :) Molly, we must have met somewhere at the market - I'm there all the time too. I must introduce myself :) Michelle, I'm holding out for the weekend too - this morning I definitely do not want to leave the house! Good luck to you guys! Congratulations! I am so happy I found your lovely blog. I made a request for this cookbook at my local library; I think I'm the twenty-fifth person in the queue! Congratulations on 2 years! Florida here. 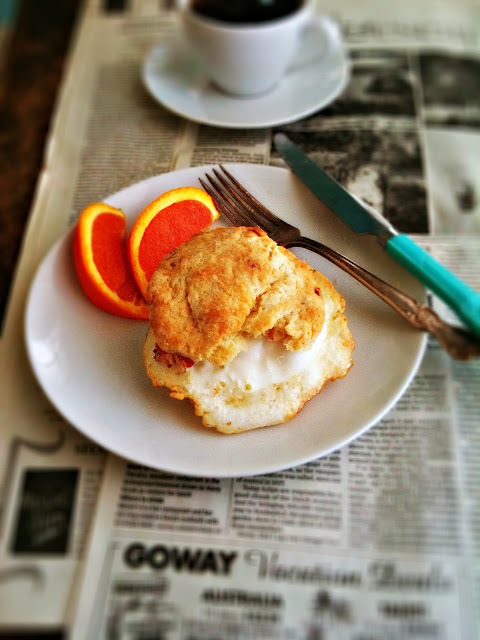 The biscuits look amazing and are a must for this weekend! Your blog is still my favorite place to find yummy treats Renee, keep 'em coming! 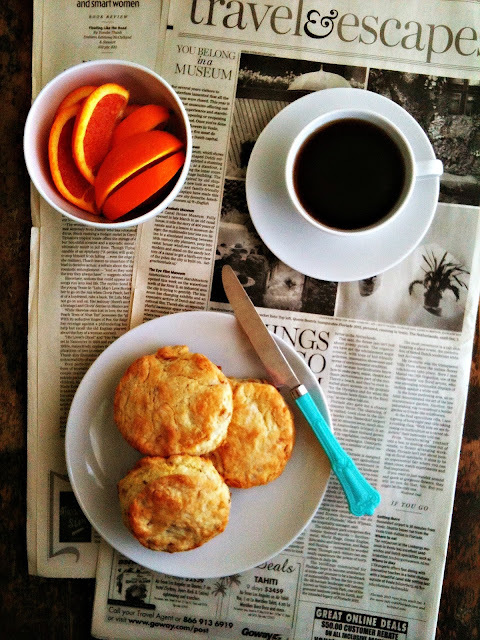 You're favorite post of mine is the biscuit recipe. It's definitely a staple in my home now. Congrats on two years of successful blogging! Congrats on the 2 year blogiversary! Best wishes for many more years of blogging, cooking and eating! I'm making white bean chicken chili tonight - can't wait! Congratulations on your anniversary!! Biscuits look great. My grandma told me lard and buttermilk were the ingredients to use for the flakiest biscuits and hers were fantastic. Two Years! Congratulations and thank you! Winnipeg is not as cold as it could be, sitting at -24. I hope to have bread in the oven soon, and a pot of lentil soup on the stove for supper. michellecleland(at)hotmail(dot)com... to contact if my name is drawn for your fantastic giveaway. Congratulations on two years of incredible food and photographs, for winning cookbooks and for all that 2013 is sure to offer. I just discovered your blog today and I love it. The other night I attempted to make eggplant Parmesan and managed to not screw it up! I also made a delicious peanut butter pie. Happy blogging! Hi Renee!!! Pick me! Pick me!! At present, the food on my mind are cookies I'm making for a baby shower. I was just thinking of making some biscuits tomorrow morning and these are it! Living in Vermont, maple syrup and bacon are two things I must always have in my fridge. Thanks for the recipe and congratulations on 2 years! Wow! What a great response! Thanks for all of your well wishes and dinner stories. Keep them coming! Yum! Maple and bacon? Yes, please! Hope you have a great 2013. Renee!!! 2 Years! Wow! I remember when you and Shannon were just getting this site going! Congratulations! I love stopping by and reading your posts. Tonight I made double smoked turkey, spinach and swiss panini's with a strawberry, spinach and parmesan salad. I'm sick of this winter cold! Time to break out the summer recipes. Congrats again Renee! Looking forward to another year of posts filled with honesty, laughter, life lessons and of course fantastic recipes! Renee, I love contests, but I love you even more. Stay warm and beautiful, my lovely. Pouring rain and leftovers! Pretty grim! beautiful. Thanks for thinking of us with the cook book! Email....imruggers @aol.com. CONGRATULATIONS ON YOUR 2 YR ANNIVERSARY! I HAVE REALLY ENJOYED YOUR BLOG! I made homemade minestrone as it was clean-out-the-fridge night before I need to move. I used mr. noodles in it... no regrets! Everyone's posting the temperature...28 in Sydney. congrats on the anniversy and looking forward to year 3.
also since temp seems to be popular it is mid-50s in westminster but w/ a cold front moving throgh and low tomorrow expected to be in the 20's and snow on horizon. Happy anniversary - to us, haha! Have been reading Sweetsugarbean since May, 2012. Excited for year three - it's gonna be a big one for you! My sister introduced me to your blog. She loves it! We cooked a lot as kids and both continue to love cooking as adults. I am very excited to start browsing around and checking out your blog. Happy birthday/anniversary! I've just discovered your blog through Pinterest, and I already love it! I'm already a fan of Smitten Kitchen, so I can't wait to explore your posts. Looking forward to trying the Maple Bacon Biscuits... YUM!!! The weather: There's too much snow here, after a day of spring temperatures. Dinner tonight: Jamaican Rice and Peas. Your posting of crostini with strawberries and balsamic vinegar is especially nice. Happy Anniversay! I love this book! I recommended it to everyone as a gift this holiday season but of course didn't get one for myself. Here's to a great third year! Congratulations on 2 years! I am just 4 months in, and loving it so far!! Will be trying this biscuit recipe for sure. Tonight though, will be making salted caramel pineapple upside down cake!! Congratulations, Renee. Best wishes for many more years & a few perks too. Thank you everyone for the weather updates, dinner stories and kind words. I can't wait to see who will win! Congratulations on two years of absolutely beautiful content. These look sublime. Add some Springsteen on the stereo and some sunshine and it's a recipe for a perfect Sunday morning. Tonight I'm having Indian food at a local restaurant with a friend! Love me some Indian food. 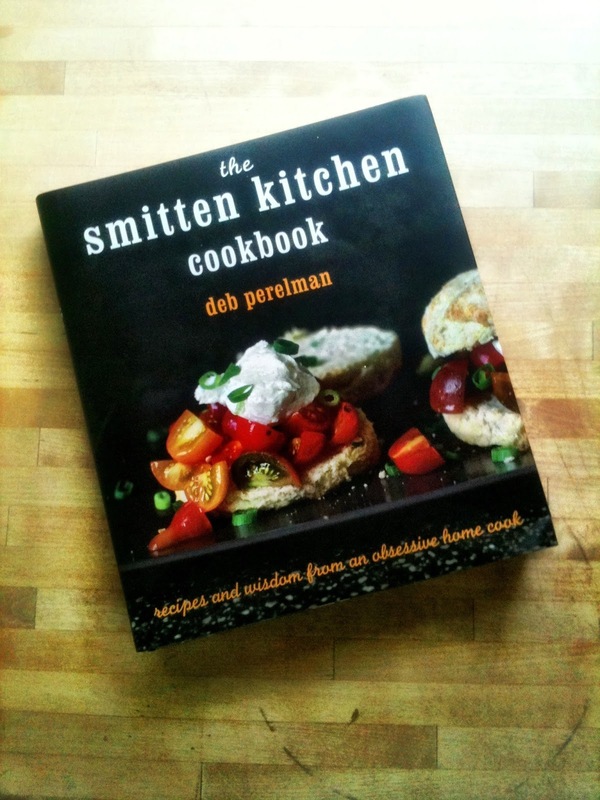 I would love to win this cookbook! Love this! Going to make it for Valentine's Day Breakfast - hubby loves bacon and maple! And eggs. Congrats on your Blog-a-versary! In grey, windy Nova Scotia we had Jamaican Jerk Chicken for supper! If we are not in the tropics at least we can eat like we are!! Tonight I am having smoked cheddar macaroni and cheese with chorizo! yum! Happy Blogiversary! Time flies doesn't it? ahh, those biscuits look and sound divine. Maple + Bacon, I mean.. how can you go wrong? delicious. I liked you on facebook as well, I thought I had a long time ago but apparently not! Woohoo for getting the signed copy of the book - way too cool! Loving your photos. Happy Anniversary! Favorite post: I can't decide - am especially in love with your photos.